GARC Statement in relation to PSNI differences in policing Loyalist protests as opposed to residents protests. For the past six week Loyalists, led by the UVF and various factions of the UDA, assisted by the Loyal Orders and Unionist politicians have been engaged in illegal roadblocks across the Six Counties with the vast majority taking place in the Greater Belfast area. These roadblocks have been deemed as “peaceful” despite the presence of armed masked men, including paramilitaries, who have denied members of all communities access to their homes and essential services, while in one shameful episode an elderly man was denied entry through a Loyalist roadblock in order to visit his dying wife and jeered as he was forced to turn back, in full view of the PSNI. In addition to these roadblocks, Loyalism has again demonstrated its willingness to attack vulnerable Nationalist and Republican Communities, with the Short Strand, as it has for generations, facing the brunt of these incidents with unprovoked incursions and attacks on the homes and residents of that area. In effect the Short Strand is once more under siege from the UVF in East Belfast, and as before it is with the passive approval of both the Ulster Unionists and the DUP. The Greater Ardoyne Residents’ Collective fully supports the residents of the Short Strand in their plight and their right to defend their homes, Church and Community. From the outset of these series of events there seems to be confusion around what Loyalism is actually protesting about. Are they protesting against a vote by Belfast City Council to fly the Union Flag on certain days a year? Against social deprivation in Loyalist areas? Against supposed equality for Nationalists/Republicans in the Six Counties? Against Inquiries into State Collusion and Murder? Against the use of Gary Haggerty as a supergrass in a trial implicating most, if not all, the UVF leadership? 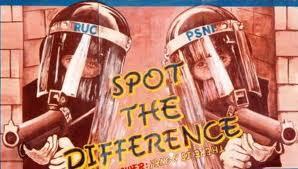 To unite Loyalism and Unionism, interestingly by having two politically exclusive forums? Unfortunately it seems that the spokespeople for those organising these protests don’t know themselves, as clearly demonstrated in the media and most shambolically on a recent edition of the Nolan Show on BBC television. It is important to note these comments when comparing the actions of the State, propped up by Robinson’s OFMDFM, and their armed militia the PSNI, when nationalist Residents have exercised their right to peaceful protest. In Ardoyne in 2010 GARC staged a sitdown protest on the Crumlin Road to prevent an unwanted sectarian march from passing through our community. A sitdown protest that took place on a road already blocked by the PSNI to facilitate this march, and as such was causing no further hindrance to the alreadt disrupted lives of local residents. The PSNI response was not to “sweep” Residents away, but to use dogs, armed men’s fists and batons to remove people. 29 Residents and supporters were subsequently charged, taken to court and prosecuted, with many going to jail and others currently being pursued under live arrest warrants to be taken to Maghaberry. Compare that to the complete inaction of the PSNI when it comes to facilitating a handful of Loyalists blocking main and secondary arterial routes in Belfast and elsewhere and ask has there really been a new beginning to policing in the Six Counties. Unbelievably, while Loyalist paramiltaries and elected Unionist representatives laugh and chat with officers from Tennent Street PSNI Barracks as they block roads surrounding Ardoyne, at Hesketh, Twaddell and Cambrai, officers from the same Barracks have for the last month been calling to Residents homes in Ardoyne and cautioning them for “illegally protesting” against an Apprentice Boys parade on 1st December 2012. This is despite the fact that no GARC protest was called, all of those cautioned were standing on an open footpath beside a functioning bus stop and outside shops that were open for business, none were holding placards or banners, none made any noise or gestures as the parade passed, none obstructed the parade or road and none were masked. Four Residents were actually cautioned prior to the Parade passing after local “community reps” were witnessed pointing them out falsely as “organisers” to a police officer they attend local Interagency Meetings with, while others have been cautioned as the PSNI called to their home. As a result, one Resident has already instructed his solicitor to initiate legal proceedings to have his caution withdrew, with a judicial review to follow if this is refused and the other Residents are in the process of starting the same legal proceedings. The actions of the PSNI, both in terms of facilitating Loyalists in their protests that have caused huge distress to their own and neighbouring communities, massive disruption to the local economy at a time of recession and directly led to the violent life threatening attacks on the Short Strand, and in terms of persecuting Residents opposed to sectarian parades while refusing them the same right to peaceful protest clearly demonstrates that they are a sectarian force with the same sectarian mentality of their RUC forerunners. It is time for people in Ardoyne, and other communities that are victims of their harassment and persecution, to make a stand and demonstrate that they are not welcome or acceptable as a politically unionist police force. Apologists for this armed militia within our community should also cease and withdraw their support for the PSNI, and instead show support for their neighbours, and in some cases friends and family, who are constant victims of PSNI intimidation and harassment. Greater Ardoyne Residents Collective, 18 January 2013.